We are looking at spending New Year's Eve in Boston and seeing the Winter Classic hockey game on January 1 at the Gillette Stadium. We would like a hotel with indoor pool that is conveniently located but not too expensive. I really like Hampton Inns. 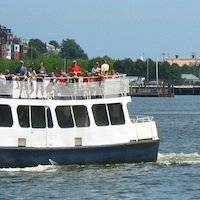 What would be a good choice of a hotel near Boston New Year Eve attractions? Also, is there public transportation to Gillette Stadium? How totally exciting that you will be coming to Boston for the Winter Classic - and also spending New Year's Eve in Boston! 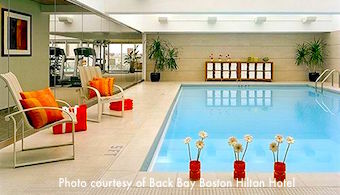 I'm happy to recommend a few hotels with indoor pools close to First Night, Boston's biggest New Year's Eve celebration. First Night is a huge day-and-night-long gala in central Boston and features lots of performers, ice sculptures, a parade, music, and even fireworks at 7pm and midnight. I've included recommendations for hotels with indoor pools convenient to many of the First Night activities below, along with information about Boston-area Hampton Inns and transportation possibilities for getting to Gillette Stadium. Have a wonderful time in Boston and at the Winter Classic! 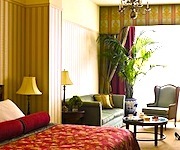 Since many First Night performances and other indoor events take place in Boston's beautiful Victorian-era Back Bay neighborhood, particularly in Prudential Center, I'm going to recommend hotels in that area. New Year's Eve night temperatures often range from cold to frigid, so being close enough to your hotel to be able to pop in and get warm could be a benefit. These hotels are reasonably close (ie, a few blocks) to Back Bay Station. If there is special train service to Gillette Stadium for the Winter Classic - more about that in a minute - you could board the train at Back Bay station. These are all large top-end business hotels with lots of amenities (which is why they have indoor pools) but their New Year's Eve rates are usually competitive. 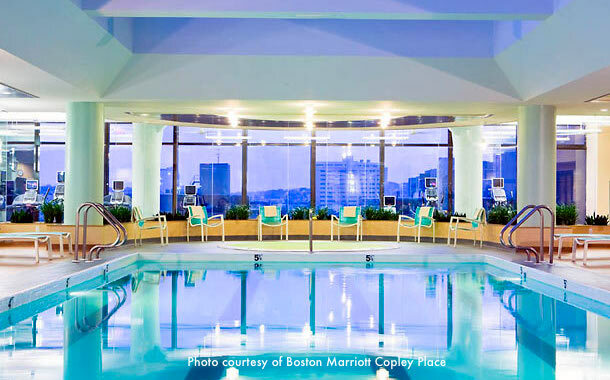 The Sheraton Boston Hotel is Boston's biggest hotel - and also has a spectacular indoor pool with a retractable glass roof. Located on the Sheraton's 5th floor, the pool connects to the rooftop sun deck - just in case we get an unusually warm winter day. The Sheraton connects directly to the Hynes Convention Center and Prudential Center, and Newbury Street shopping is just steps away in case you want to check out the post-Christmas sales. The Back Bay Hilton Hotel is also very close to First Night festivities at the Hynes Auditorium. Although the indoor pool is smaller than the Sheraton's, it is still quite nice, and the hotel itself is lovely, with wonderful city and river views from the top floors. The Marriott Boston Copley Place is Boston's largest hotel and also has a spectacular indoor pool - that's it at the top of the page. The Marriott adjoins Copley Place (shown in the photo at the right), a small shopping complex featuring luxury brands and Boston's Neiman Marcus. The Marriott's location is several blocks farther from Hynes Auditorium than the Sheraton or the Hilton - but you can get there via a skywalk and cutting through Prudential Center without going outdoors if the weather is frigid. 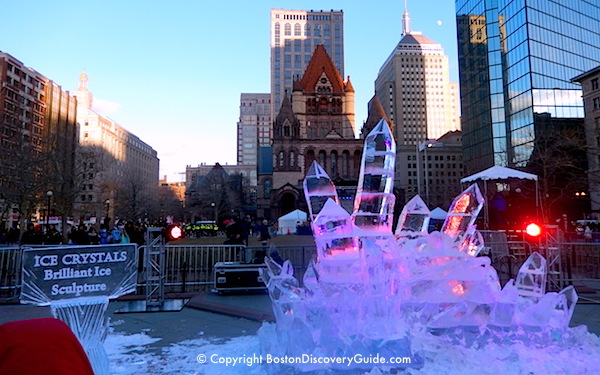 The Copley Marriott is closer to Boston Common, site of more First Night ice sculptures, other activities, and the 7pm fireworks. But more to the point, it is also closer to Back Bay Station, which will be handy if train service to Gillette is available. I also like Hampton Inns, and have stayed at them in areas of the US where they were by far the best choice. However - the ones in and near Boston may not be in the best location for enjoying First Night, getting around the city easily, or having easy access to a wide range of restaurants, shopping, or tourist attractions. As far as I am aware, though, they do all have small indoor pools and offer complimentary breakfast. Hampton Inn & Suites Boston Crosstown Center (811 Mass Ave, Boston) - Located in Boston's South End behind Boston Medical Center, a busy city hospital. It is next to a busy road that connects to Interstate 93. It is a 10-15 minute walk to the nearest T (subway) stops, and not close to First Night festivities or other tourist attractions. Hampton Inn Boston Logan (230 Lee Burbank Highway, Revere, MA) - Great choice for anyone who wants to stay near Logan Airport, and popular with travellers who want to take advantage of their "park and ride" rates. They offer a courtesy bus to the airport, and from there you could take the airport bus to either the airport T stop (Blue Line/Airport) or the water taxi wharf to get into the city. Hampton Inn Boston/Cambridge (191 Monsignor O'Brien Highway, Cambridge, MA) - Located on the east edge of Cambridge, a couple of blocks from the Green Line/Lechmere T station. A busy highway lies between the hotel and the station - you might want to call the hotel, if you're considering staying here, to ask how easy/hard it is to walk to the station.You could take the T to Copley Square/Hynes Auditorium - about 30-40 minutes from the hotel on the Green Line. 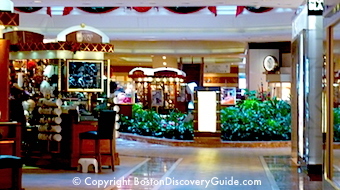 Cambridge Galleria Mall, which has a food court and a couple of restaurants, is near Lechmere station. During football season, a special train service runs between Boston and Gillette Stadium to transport New England Patriots fans to home games. Occasionally, the train also provides transportation to other big games - so it is possible that this might happen for the Winter Classic. As far as I am aware, no announcements about the train have been made yet - but since the stadium holds almost 70,000 spectators and is likely to be filled to capacity, train service seems like a reasonable possibility. Once we get more information about train service, we'll post updates on our Winter Classic page.